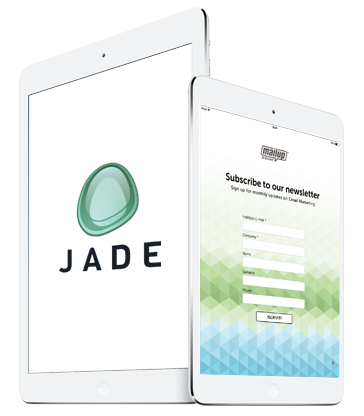 With Jade you can collect email addresses and other information with a signup form hosted on your iPad or Tablet, even when you are offline. Perfect for trade shows, events, points of sale, restaurants or whenever you are on the go. Choose your form With Jade you can create all the forms you need and connect them to your MailUp lists. Switch between forms based on the occasion and the type of contact you want to collect. Collect contacts offline Jade works for you even when you’re not connected to the Internet. Data is saved on your device and pushed to your MailUp account when you reconnect. Customize the form Select and rearrange fields, push new subscribers to groups, choose between a set of professionally designed backgrounds or add your own.